Barrie Colts at the 2017-18 OHL Awards. #OHL - Very Barrie Colts | A website covering the Barrie Colts of the OHL. Today in Toronto at the Hockey Hall of Fame, the OHL handed out awards to the recipients from this past 2017-18 season. A couple Barrie Colts took home some hardware. Here is a quick look at how the Ponies did this year! Picture from Barrie Colts OFFICIAL Instagram. Aaron Luchuk won the Eddie Powers Memorial Trophy after splitting this past season between the Colts and Spitfires. He finished the season with 50 goals and 65 assists over 68 games. Luchuk is the 3rd Barrie Colts player to win the award in league history. The last Colt to do so was Kevin Labanc in 2015-16, putting up 39 goals and 88 assists. Sheldon Keefe was the first Colt to win the award in 1999-2000 scoring 48 goals and adding 73 assists. Luchuk also took home the Leo Lalonde Memorial Trophy, making his the 4th Colt to do so, and the 3rd over the last 4 seasons. 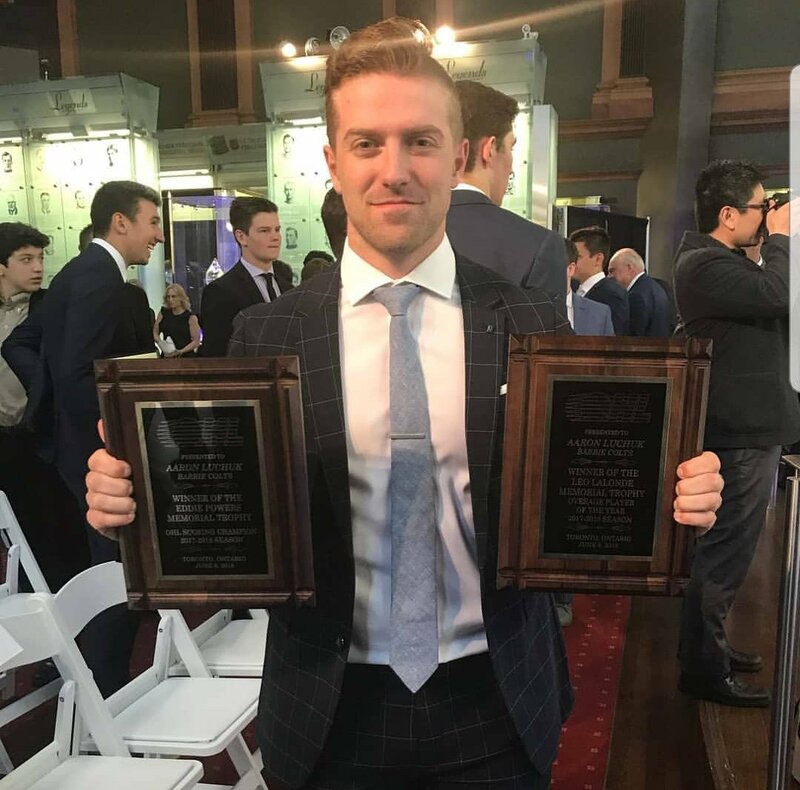 Joseph Blandisi (2014-15) and Kevin Labanc (2015-16) were the other two to do so over the past 4 seasons, and the first and only other Colt to win the award was Bryan Cameron in 2009-10. 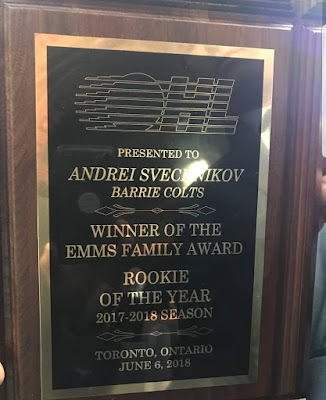 Andrei Svechnikov was named the Rookie of the Year after an impressive rookie campaign. The top prospect at the upcoming NHL Draft finished his rookie season putting up 44 goals and 32 assists in 44 games. Pretty incredible numbers for a rookie, and nobody came close to him point wise among rookies. Cam Hillis of the Guelph Storm came 2nd in points in the OHL for rookies, putting up 29 goals and 30 assists. Svechnikov managed to total 13 more points than Hillis in 16 less games. 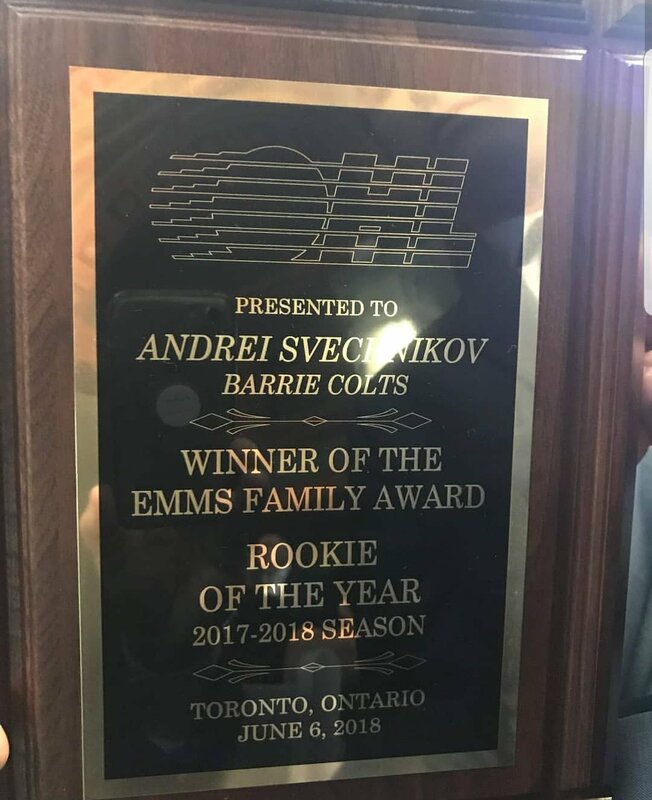 Svechnikov is the 4th Barrie Colts player to be named the OHL Rookie of the Year in league history. The others are Aaron Ekblad (2011-12), Bryan Little (2003-04) and Sheldon Keefe (1989-99). Congratulations to Aaron Luchuk and Andrei Svechnikov! To see the complete list of winners, click here to view them at the OHL website.